Thank you for your interest in our Norway and Iceland Tour. 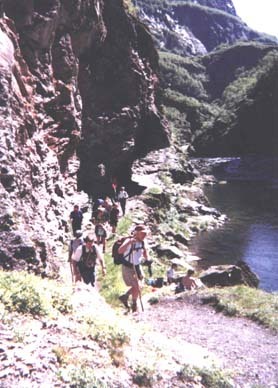 Our Annual Summer experience is different and unique for individuals who like to be out-of-doors and enjoy fantastic scenery. 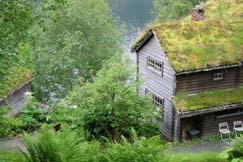 This is for the nontraditional traveler who wants a spectacular country vacation; touring, walking/hiking/cruise/bus/train and photography adventure in fjord and volcanic lava country. It will be your choice, “YOUR WAY - IN NORWAY AND ICELAND”! The following is a brief overview of some things you need to know prior to trip enrollment. 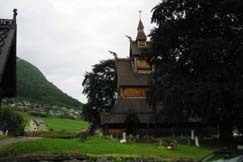 See the Scandinavian and Iceland countryside. 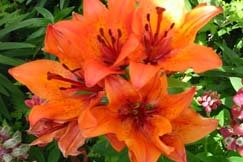 Walk/hike through mountain areas with brilliant wild flowers and berries. 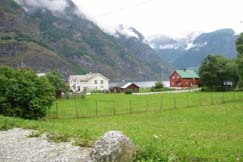 Visit quaint villages and towns in the fjord country. Fish in lakes and trout streams. See peaceful lakes, beautiful waterfalls and quiet streams, geo-thermal hot springs. At days end, we will stay in Mt. Lodges and Hotels that are frequented by other visitors, who are also on holiday (vacation). All accommodations are first rate having clean rooms, comfortable beds and plenty of delicious food! Fully escorted bi-lingual Norwegian and Icelandic guide from arrival in Oslo and Reykjavik, respectively. 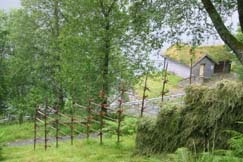 Our guides are knowledgeable about the country, the area we travel, terrain, plants, culture, history and most all Norwegian and Icelandic issues. 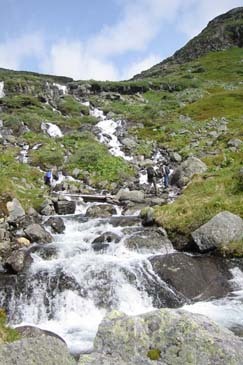 Leisure walking or mountain hiking for pleasure and exercise through back country's exciting scenery. Photography of the picturesque country-side and city sites. Experience Europe's largest mainland glacier, the Jostedalsbreen, Glacier museum. 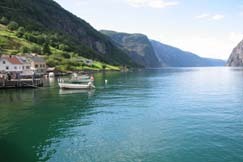 Explore the Sognefjord, longest fjord in the world; 127 miles long and 4,290 feet deep. 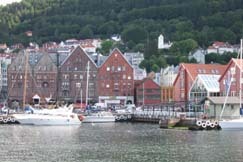 Visit Bergen’s Fish and Flower Market and Hanseatic buildings along the waterfront. Blue Lagoon - Geothermal Spa. Whale Watching / Sea Angling. 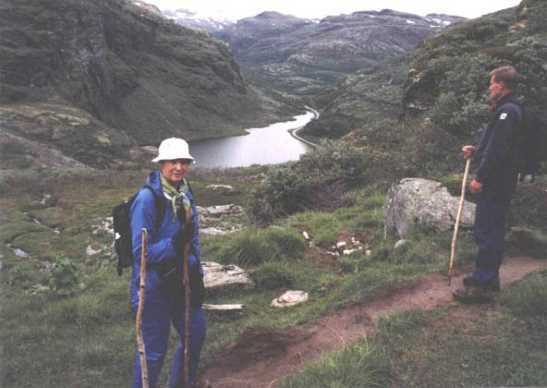 “Your Way” will cater to your daily preferences, ranging from no hiking to potentially strenuous -- the level each day is entirely your own choice and does not require arduous hiking. Typical age range has varied from 12 - 85 years old. 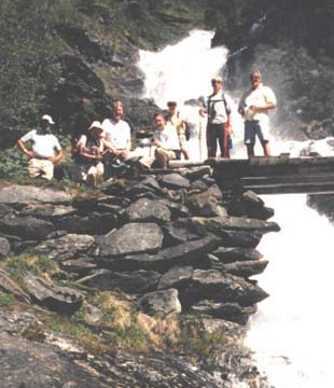 Various options are available daily, some members of the group may wish to take the day hikes, while others may wish to bus on a particular day and do their own leisure activity. A light day pack to carry your necessary sundry items (rain suit, camera, lunch, etc.) will be required. Your luggage will be transported daily to our next night stay. 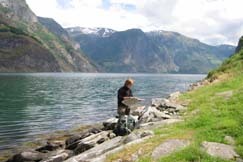 Fj�rland a village in the Sognefjord near the largest glacier in Europe. The price is $5,267.00 plus taxes. At Sign-up $350.00 is due. This tour is on a first come basis. 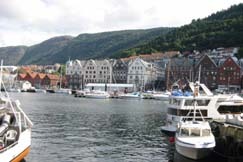 You may visit other Scandinavian or European Cities, for up to thirty (30) days. Your trip can be customized to meet your needs. This price is based on a minimum of fifteen (15) participants and double occupancy; with currency rate and airline fuel costs as of August 20, 2018. (Price is subject to change.) You can request a Single Supplement and/or your stay can be extended with only a minor fare increase. Ask about extensions at Sign-up. Air travel, round-trip from Minneapolis; ICELANDAIR regular scheduled flights to Norway. Rail, deluxe motorcoach, expressboat and ferryboat transportation. 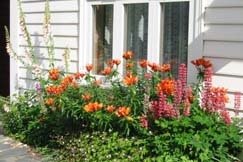 All accommodations are in first rate lodges and hotels with clean rooms and comfortable beds. All meals included, except (5) lunches and (5) dinners for 14-days. 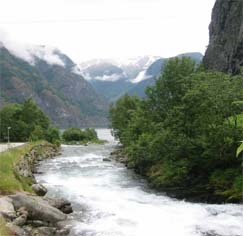 Riding on Scandinavia’s most exciting railway, the Flam Line. This is the steepest of its kind in the world! Ferryboat round-trip to “Goat Cheese” capital of Norway-Undredal. Sightseeing in Oslo; home of Vigeland’s Sculpture Park and Bygdoy museums. 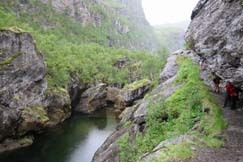 Sightseeing in the Fjords, Glaciers, Geysers and Waterfalls. The Oslo Card - Unlimited free travel on various kinds of transportation, free admission to most museums and sights. Sightseeing “The Golden Circle”, the Wonders of Iceland in one-day. Reservations are accepted on a first-come basis and enrollment is limited. To be included in the Summer Experience, a deposit of $350.00 is required at enrollment. The next payment of $750.00 is due by March 1, with the balance due by April 10. For an application email: marvkaiser@earthlink.net. Norway, Sweden and Denmark and Other European Countries. Departure Date: June 19, 2019. Extensions must Return within thirty (30) days.